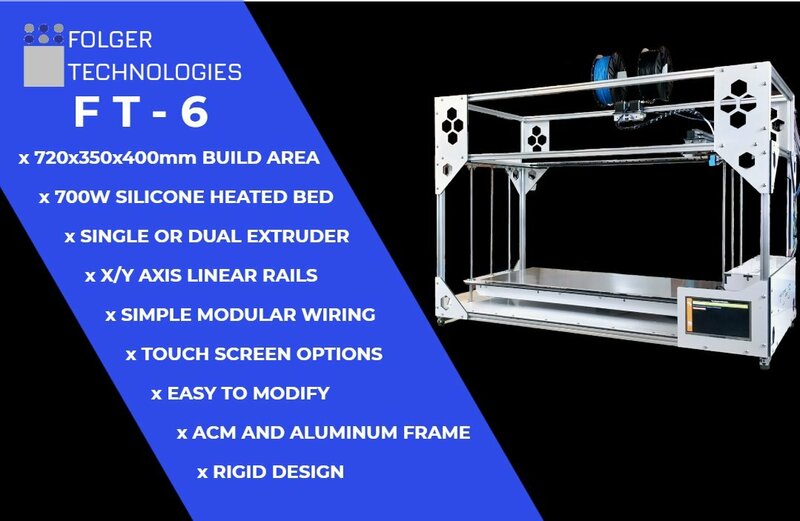 The Folger Technologies FT-6 and FT-5 are great kits combining the simplicity of an erector set with the power of a much more expensive desktop printer. The kit comes with everything you need to assemble the machine with the use of a few simple tools and a little bit of time you too can get started 3D printing the world's next big idea. The highlights of this kits are the massive 720x350x400mm build area, Linear rails on the X and Y movements. Dual Y motors for added speed and power. This kit also includes an aluminum build surface/headed bed capable of printing many materials including PLA and ABS. Thoughts on the FT-6. Printing about 24-inches wide on the FT-6.Great system for the price point. Some m5 washers would really help with the tightening up the belts at the bottom. I think trying to dial in everything under the printer was the hardest part. Once everything was working tho it’s been amazing. I’ve been up for a week now developing prototypes.